Oatmeal Protein Pancakes was posted on August 24th, 2011 and is filed under Breakfast, Dairy Free, Gluten Free, Protein, Recipes. This entry has 19 comments. You can follow any responses through the RSS 2.0 Comment Feed. 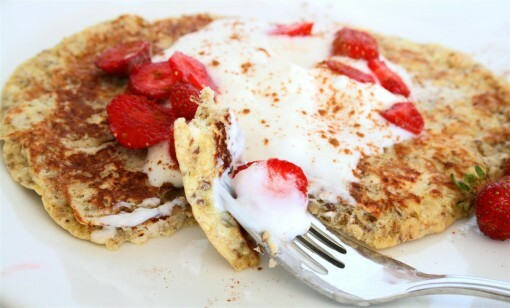 I’m about to introduce you to my newest obsession…protein pancakes! I make them a million ways, but this is one of my favourite versions! I had one of these fat, big pancakes after a hard morning workout this morning before everyone else was up (sometimes that’s the only way to get your workouts in!) and it was a-mahhhh-ziiing! It’s got loads of protein (with my protein powder about 30g! ), fibre, healthy fats, it’s gluten free, dairy free, and it’s filling…which is why this is one of my favourite breakfasts ever. I used a whole organic egg in this because I’m one of those people who believe in lots of healthy fats, but you can easily just add more egg whites if you’re not keen on the egg yolk. Just whisk up all those ingredients in a bowl. Pour onto a lightly misted (with olive oil) non-stick pan and cook! Simple as that…it’s such an easy breakfast to make and it literally takes just minutes. If you find it’s too dry, just add more almond milk! I topped mine with plain yogurt (you can sweeten it with Truvia – it’s what I do!) and fresh, organic strawberries from the garden. Dig in! And just when you thought it couldn’t get better I smothered my pancake with pure maple syrup (yes, smothered!). I could sense little angels dancing on my tongue. 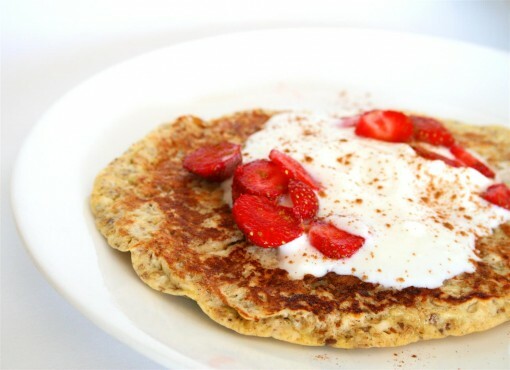 Have you ever tried a protein pancake? What flavour would you like to see next time? Wow, that does sound like something that’ll get you going in the morning! And I love putting yogurt on my pancakes too. Thanks for the recipe. I’ve never bought protein powder, but I’m going to bookmark because I’m very intrigued by the ingredients here. PS I love the way you create your recipe cards. What a great idea. They say having protein in the morning is really good for you and helps fill you up for the rest of the day. This is a great alternative to eggs! 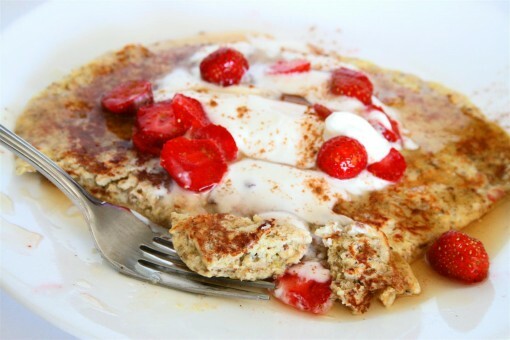 I have yet to try protein pancakes but they would be an awesome post workout/run breaky! I have a favorite multigrain mix I use and add stuff to it – fruit, flax, chia seeds – always thinking up a new combo. 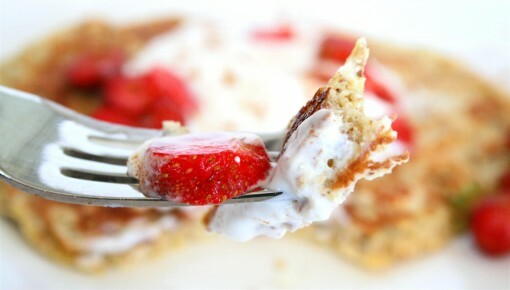 I love topping my pancakes with Greek yogurt for extra protein too! I found your blog from you guest post at Carissa’s blog and I have to say I love it! What a wonderful idea! It sounds healthy and looks delicious! How crazy! I made (vegan) peach-banana-strawberry-granola pancakes last weekend… and yes, you guessed it–added protein powder! Such a great way to sneak in some extra protein. And I love how fluffy your pancakes look! This brings back memories! When I was a serious gym rat several years ago I used to make protein pancakes with blueberries. I’ll have to try your version — maybe it will motivate me to get back to working out somehow! looks really great. I know I’ll be obsessed too once I get my hands on them, looks delicious. is there a way to make the protein content (in grams) higher than the carb content with this protein pancake? Iby~ There are few ways you can do this! 2. Reduce the oatmeal. I make protein pancakes with no oatmeal all the time and they’re great! Try using 1/8 cup instead. 3. Add a couple tablespoons of cottage cheese. I love adding this because of the added protein and the texture it makes! The Pancakes were too dry. Is the quick oats have to be Pre cooked? Patty~ No, they don’t have to be precooked. If you find it’s too dry, just add more almond milk or even add a little yogurt to the batter before you cook it.